FELLOW ROUND-LAKERS! : There were two things in particular last year I did some research on that I'd like to share with you in terms of our beautiful lake resource. I've attached pictures of both. One is the Chinese (banded) Mystery Snail. The other is the Mayfly larvae exoskeleton. The Mayfly exoskeleton was really interesting because they only show themselves for a day or two in early to mid summer. You can see thousands of them in the water at the surface. Seeing these is a great sign and indicative of a very healthy lake ecosystem. They are high in nutrients and yes, fish eat them. 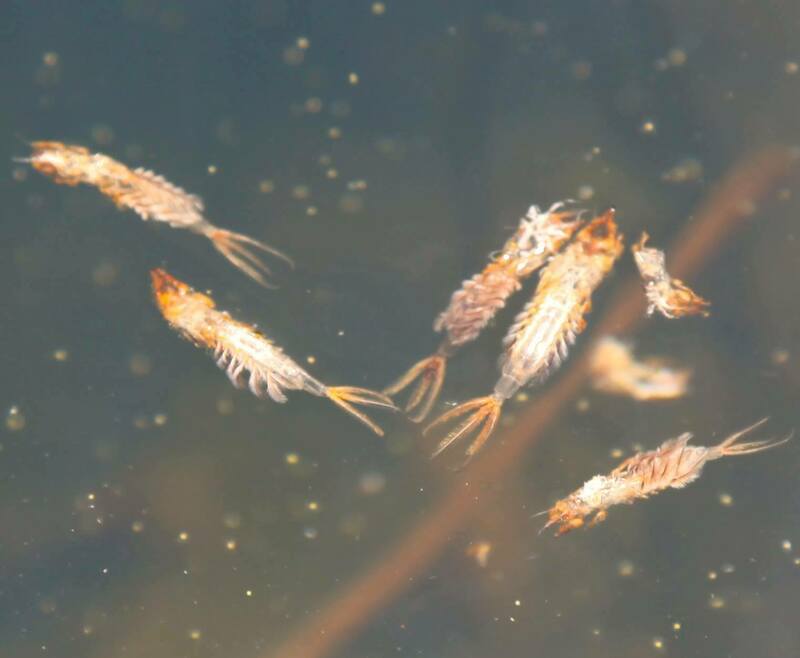 The Mayflies stay in the nymph stage for over a year, and like some dragon fly species live for up to three years as nymph macro invertebrates before they hatch. The kind of look like little shrimps in the water. Way cool but I wouldn't suggest deep frying them or anything like that! The banded Chinese mystery snails are invasive and unfortunately, nothing likes to eat them. There's also no way to easily get rid of them either. You see them all over on the lake bottom and are most visible while going over the shallows entering into Richardson's Bay. The DNR is seeing these in many of our area lakes. Not much being done right now other than keep an eye on them. Identification: Large globose shell with 6 -7 whorls. It has light coloration as a juvenile and can range from olive green to reddish/dark brown colored as an adult. It can reach 65 mm tall. Ecology and Natural History: The Chinese mystery snail's native range spreads from Southeast Asia to Japan and Eastern Russia. It has invaded many states, as shown in the map below. The species was introduced through freshwater aquarium trade and the Chinese food market. It prefers to live in still waterbodies with silt, sand, or muck substrate, but they can also survive in slow regions of streams. The Chinese mystery snail feeds on organic and inorganic bottom material as well as algae. Females live up to five years while males live up to three years. Females usually produce over 170 young in their lifetime. 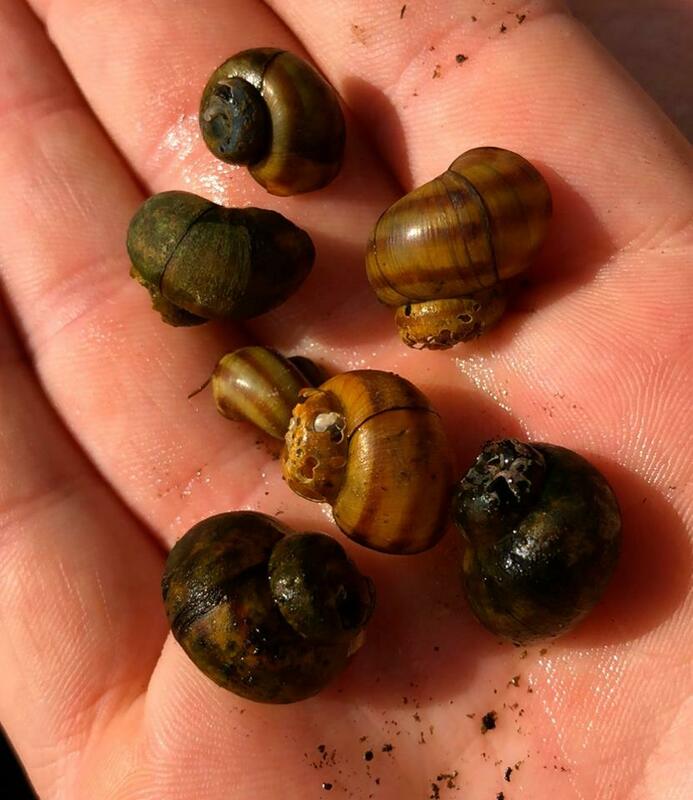 Chinese mystery snails live in shallow water from spring until fall. In fall, they move to deeper water to overwinter away from the shore. Impact of Introduction: They have been known to clog screens of water intake pipes. Chinese mystery snails have the potential to be a vector for the transmission of parasites and diseases.